Saturday, March 18, 2017, marked the official return of an authorized Gamut dealer to the greater Chicago market. 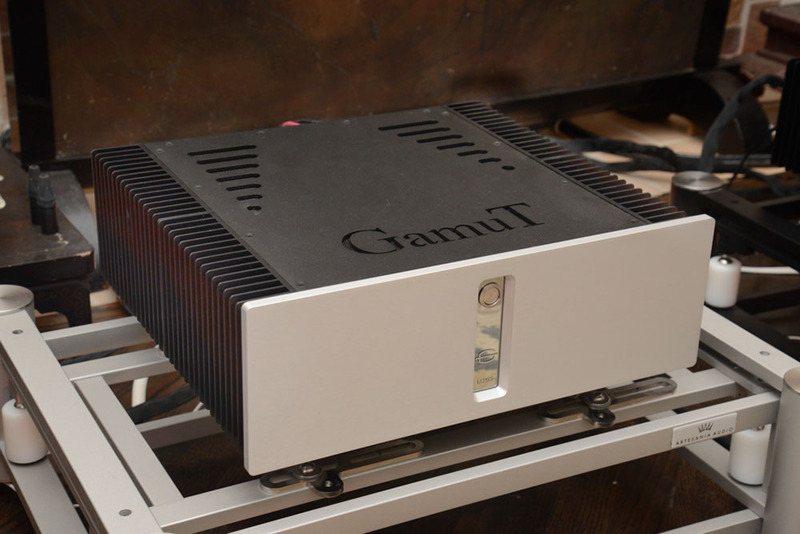 To celebrate the occasion, Gamut’s Chief Designer and CEO, Benno Baun Meldgaard and Michael Vamos, President of Gamut USA, were on hand for an event at Kyomi Audio, located in the Irving Park area of Chicago, approximately halfway between Navy Pier and O’Hare International Airport. Kyomi Audio’s owner, George Vatchnadze, is a touring and recording concert pianist as well as the Coordinator of the Keyboard Division of DePaul University’s School of Music. For both roles George travels the globe: In May he’ll go to Georgia (Russia) to perform, and then in September to Osaka, Japan, for a two-night performance of the Rachmaninoff Piano Concerto No. 3 at the Osaka Symphony Hall. His latest recording, a reading of the Prokofiev Piano Sonatas 6 and 9, will be released this summer on the Exton label of Japan. Every summer George also runs his own private, selective two-week Piano Academy for accepted students in Lago Maggiore, Italy. 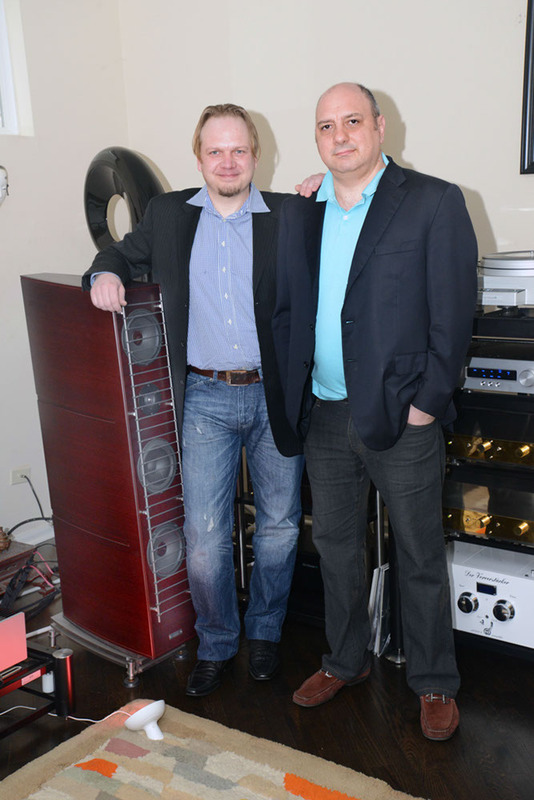 Kyomi Audio operates within George’s multi-level home, and this event featured an encore showing of the same components the company presented at AXPONA 2016: the Gamut RS7i loudspeakers ($39,990/pr. ), M250i monoblock amplifiers ($25,990/pr.) pictured below, and D3i dual mono linestage ($8390), pictured second below; Gamut Reference cables connected the system: biwired speaker cables (starting at $3790 for 1.5m), interconnects (XLR and RCA, $2990 for 1m), and power cords ($4290 at 2m). This setup gave listeners the opportunity to hear these remarkable products in an environment similar to one they might actually live in. And, because both George and Benno had collaborated to refine the room’s setup, the system was completely dialed in. Sources included either a laptop PC serving PCM and DSD files using the Stealth USB-T cable ($1250), or the MBL 1621a CD Transport ($28,000), using the Stealth V-16T Sextet AES/EBU cable ($4400), handing off to the MBL N31 CD/DAC ($15,400), or the superb Air Force III ($29,750) turntable, fitted with a Graham Engineering Elite ’arm ($12,000), Koetsu Jade Platinum cartridge ($9995), and the Stealth Helios phono cable ($9800). As the Gamut D3i was not equipped with its phonostage plug-in module, RIAA decoding was provided by the superlative Jadis JP200MC preamplifier ($32,900). Equipment was supported by Artesania Exoteryc Racks ($6990), and the Air Force III was suspended on the Artesania Krion turntable platform ($3390), while the amps rested on the Artesania Aire amp stands ($3690/each). The event started on time to a packed room full of current and potential Kyomi customers. As Benno’s presentation unfolded, it became clear that both he personally and Gamut as a company were committed to eco-friendly manufacturing processes. Gamut uses almost exclusively natural products, and the electronics series they will be introducing soon employs a 96% paper/4% carbon fiber material, pressed at extremely high pressure, in place of aluminum or another metal for their chassis. Benno noted that the more ways he found to employ natural materials in his designs, the more natural and organic-sounding the entire Gamut system became. The manufacturer’s commendable “green” efforts appear to be not only an amazingly responsible but also seemingly effective business approach. The Gamut RS7i speaker cabinets, like all Gamut enclosures, are made using between 21 and 28 layers of two different types of wood of varying thicknesses shaped into form under heat and great pressure. The resultant 28mm-thick finished laminate is highly rigid, due to the effects of the constrained layering and composite adhesives, so they retain their shapes with less stress. In addition, this rigidity and inherent strength helps direct vibrational energy. Combined with complex internal bracing at a multitude of angles in strategic locations throughout the inside of the cabinet, it allows dramatically reduced levels of internal damping. Finally, port tuning is done for overall phase and impulse response, not just to extend bass response. The overall design goal is to have any resonances measure evenly at all frequencies, rather than to have highly obvious peaks at only specific frequencies. The RS7i’s base consists of a massive, solid stainless steel plate-and-spike system that in addition to providing great stability also houses a handful of clever features to help decouple the speakers from the floor. This base design allows for the precise adjustment of the speaker’s face angle—and by extension, the sound-wave arrival times from the drivers. Because the drive units are carefully aligned both physically and electronically, there’s a perfect tilt angle for every room and listening position. Closer or higher seating requires a steeper slope, further or lower seating necessitates a shallower cant. The driver cones are made from all-natural materials: wood fiber for the two 7" woofers, paper for the 7" midrange, and silk for the 1.5" tweeter. The paper used for the diaphragms is impregnated with a custom blend of natural oils that Benno says reduces odd-order mechanical distortions in the drivers by 20dB! The driver dust caps are fabricated of the same woods as the enclosures and are attached to the voice-coil former and diaphragm with nearly 5mm of contact area (as opposed to the more common and considerably narrower 1mm ring of contact). To make sure there is as little interference as possible in sonic delivery, Gamut uses two vertical stainless-steel rods in place of a cloth grille; these flank the drivers vertically and support a series of horizontal, fabric-woven strings to protect the drivers seemingly without obstructing the acoustic at all. Besides offering a striking and (to my eyes) very appealing aesthetic this design appears to be highly effective. Crossovers are multi-slope designs that are optimized for phase coherence, not just at the crossover point, but across all frequencies. In an effort to make Gamut speakers just a little more amplifier friendly, they all are designed with a slightly rising impedance above 1kHz. Gamut’s approach to electronics is every bit as unique. In an attempt to avoid some major sonic and technical compromises, the company’s amplifiers use just two massive output transistors. Capable of handling a continuous peak current demand of as much as 300 amperes, the amplifiers can use just one single output transistor per phase (some companies use as many as 48 per channel). By using two closely matched NPN transistors (not one NPN and one PNP), they tend to avoid the potential for the sonic smearing that is more likely when using multiple and differing devices. While I have long been a fan of the relaxed and natural sound Gamut is celebrated for, this is the first time I’ve heard it at its fullest potential—almost certainly because of the combination of the room itself (not a hotel suite), and the time and attention spent on setup. The overall system performance was so effortless and true to life in tonal color, texture, and presentation, that it was disarmingly engaging. Musical highlights at this event included a choral recording Cantate Domino [Proprius] that was so realistic sounding (and unlike hi-fi system playback) that everyone in the room was moved. Benno and I also share a love of 1960s and 70s rock ‘n’ roll, as did a number of the other attendees. Soon we moved on to some familiar classics—an original mono of The Beatles’ Sgt. Pepper’s, and original UK releases of Abbey Road and Pink Floyd’s The Wall. It became clear to everyone there that none of us were talking about the equipment! Instead, all we were talking about was the music. This remarkably engaging system simply got out of the way, and so effortlessly breathed life into any sources—LPs, optical media, PCM or DSD files—we happened to feed it. Personally, I cannot think of a much more significant achievement for any system. We were utterly and completely drawn into the music—we kept on listening until well past the scheduled end of the event. All told, I’m looking forward to getting to spend some personal time with these splendid Gamut products in my room soon.